The statue of the Blessed Virgin Mary, Mother of God, that is so dearly loved by the Filipino people is known as Our Lady of Naval. A large statue, she stands 4'8" and is carved of hardwood, although the faces and hands of the Madonna and Child are of ivory. Our Lady holds a scepter and a golden 15-decade rosary, and both Mother and Child are clothed in exquisite gold, a dress and mantle that are heavily embroidered with golden thread. The lovely statue was sculpted by a man who was neither Filipino nor Catholic, and was commissioned in 1593 by the Spanish Governor of the Philippines. The Chinese artist who gave the Virgin somewhat Asian features was well compensated for his efforts, including being converted to the True Faith through the intercession of the Blessed Mother. “Fair and comely art thou, terrible as an army set in battle array,” Holy Mother Church chants in her Office; and truly, Mary proved herself such in the battle of “La Naval,” (or Laval), in 1646. It was while the Spanish still governed the islands that they learned that a fleet of five Dutch war ships were sailing for Manila. The Dutch, bent on foraging and possible conquest, sailed their warships dangerously close to the shores of the Philippine Islands. 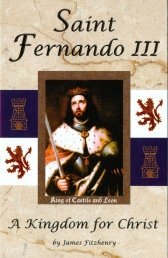 To both the Filipinos, recently converted to the Catholic faith, and the Spanish Conquistadores, devoid of sufficient arms and without warships, an invasion for the purpose of pillage or conquest was a serious threat. The Dutch were Protestants, hating Catholics, and there were no Spanish galleons in the area to defend the islands. There were only two cargo ships large enough to carry cannon, and poorly equipped with a few cannons, they were certainly nothing like the famous Spanish galleons with several banks of big guns. 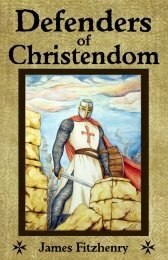 Still, they were all that was available to preserve their faith and their homeland, so they were made ready for battle as best as possible. They cargo ships were rechristened “La Rosario,” (The Rosary), and “La Encarnacion,” (The Incarnation), and placed under the special patronage of Our Lady of the Most Holy Rosary. On the altars built on deck the sailors carried the image of their beloved Queen, and there, on their knees, officers and crew prayed the rosary daily and dedicated themselves to La Naval, Our Lady of the Holy Rosary. The five Dutch warships were well-equipped with cannons, firearms and mariners, but when they encountered the two Spanish cargo ships sailing directly for them, they all inexplicably fled from the area in haste. The Spanish and Filipino defenders sailed home in glory, praising Our Lady for her protection. For the next several months the two cargo ships patrolled the waters to protect their islands. On one day in July, they were alarmed to discover they had been trapped in a narrow strait by seven Dutch warships. The Dutch did not close the distance to attack, so the men on the cargo ships waited and vowed that if they were victorious in the coming battle they would all go on pilgrimage barefoot to the Church of Santo Domingo to thank Our Lady of the Rosary. 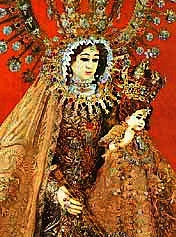 Through the intercession of Our Lady of La Naval, the Dutch ships left the area and turned toward Manila without even so much as having fired on them. The two cargo ships gave chase, and once again the Dutch retreated in disgrace. As soon as the victors arrived home, they gratefully fulfilled their vows and went on pilgrimage. After the third encounter with the Dutch fleet, the people of Manila began to call the cargo ships “the galleons of the miracle,” and a fourth confrontation and victory seemed to confirm the name. Yet it was not to be so easy, for the Dutch had prepared a fleet of fifteen warships. This time, with overwhelming numbers, they were determined to attack and restore their honor and pride. Resolved to fight and defeat their enemy at any cost, they were lucky enough to come upon the two cargo ships while they lay at anchor. With the wind against them, they would be unable to move. The crews of the cargo ships were casting off and still preparing for battle as the Dutch sailed down upon them, having every advantage. Standing their ground, the Spanish and Filipino sailors fearlessly answered the enemy fire as cannonballs landed at their feet shattering the deck or slammed into the great beams that held their bulky ships together. The smoke from their return fire caused their eyes to water and clouded their vision. 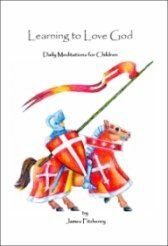 Hail Mary’s mingled with the roar of battle; the rosary beads dangling from the necks of the men as they whole-heartedly launched into the fray. Firing and praying incessantly as the day wore on, they bore the repeated volleys of the enemy and answered back with accurate fire that repelled the closest warships while others retreated afire and heavily trailing smoke. When the battle finally ended, the Dutch were once again put to flight and only fifteen of the Filipino-Spanish forces were killed. The two meager cargo ships, unable to move, had fought and defeated the enemy so badly that they limped away, never to return. This naval victory at Manila is similar in many respects to the great naval victory at Lepanto, which was also credited to the intervention of Our Lady and the power of her Holy Rosary. In both instances Our Lady miraculously defended and granted victory to the seamen who placed their trust in her. Grateful to their heavenly protectress, Our Lady of Naval, the men fulfilled their vows after the battle, which consisted in going to the Church of Santo Domingo at Manila barefoot, and instituting a public and perpetual feast in honor of the Mother of God. Even to this day that promise has been fulfilled by the Filipinos, who since that memorable time have taken as their own that pledge made by their heroic ancestors. Saint Pope Pius X granted the statue a Canonical Coronation in 1907, and the Philippine government has designated Our Lady of Naval as a National Treasure. The Church of Santo Domingo was damaged several times by fire and earthquakes as was finally destroyed by bombs in 1941, yet the statue has never been damaged. Our Lady of La Naval is presently treasured by the Filipino people in the new Santo Domingo Church in Quezon City, a few miles from Manila. From the Newsletter of the District of Asia, October-December, 2001, Society of St Pius X, and The Woman in Orbit.